The 6th Steering Committee (SC), held on 14th and 15th December in Naivasha, Kenya, stressed the importance of maintaining the momentum of the Policy Hubs and the Information Nodes created by IGAD LPI across all IGAD member states, after the end of the project in February 2012. National Steering Committee Members presented their plans for national internalisation of project institutions, following discussions held within their policy hubs. Their proposals were in some cases ambitious, while others represented a fundamental re-think on their preferred structure. In all cases, however, they re-affirmed that, building on the experience of IGAD LPI and the policy hubs, there is a strongly felt need for strong, poverty focussed national think-tanks, coupled to policy making. 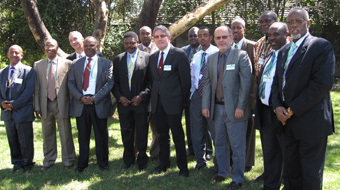 IGAD further presented its plans for continuing the work of IGAD LPI after its closure in February 2012, which will in large part be taken forward by the forthcoming IGAD livestock centre. Commending the work done by IGAD LPI, Mr Maina Karaba, Acting Director of Agriculture and Environment at the IGAD Secretariat, and Chairperson of the Meeting, explained how the centre would build up on what has been achieved so far by IGAD LPI. Presenting the proposed workplan for 2011, IGAD LPI’s Chief Technical Adviser, Dr Dil Peeling, stressed that with 14 months left to run, the project was not yet ready to wind down. He proposed several areas of engagement which would be coupled to a process of lesson learning in order to inform the institutionalisation of project gains at national level, and the establishment of the centre at regional level.